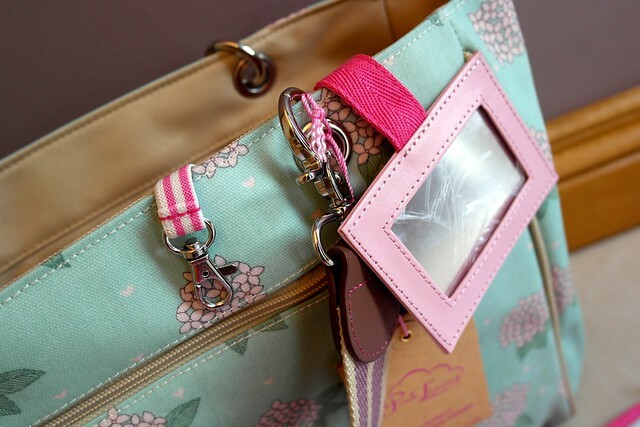 I was offered my choice from the entire Pink Lining changing bag range and it wasn't easy to find one favourite. After much deliberation, I opted for the Bramley Tote in Hydrangea because I loved the striped straps that are adjustable to suit any pram. It was always a frustration for me that not all changing bags sit well over prams as well as buggies (and don't get me started on twin buggies!!) 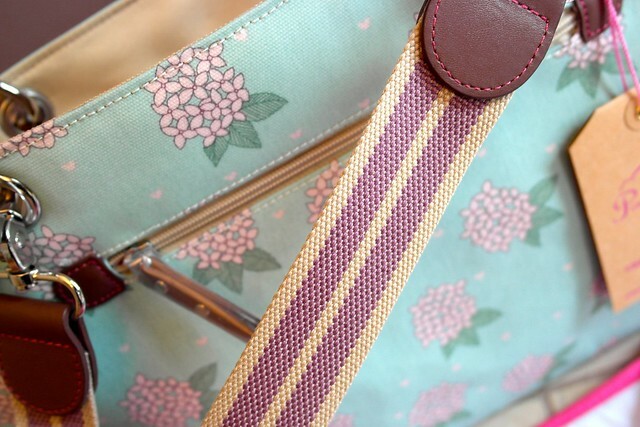 You can read more about the strap design and see photos of it attached to a pram on the Pink Lining website. Inside, the bags have pink lining (obviously! ), a decent sized changing mat, a wet bag, an insulated bottle cover, small mirror, key fob to clip your car keys onto (so you don't lose them in the bottom of the bag) and several pockets for smaller items. On the outside, it's got two large zipped compartments. Big ticks for the extra pockets - you can never have enough of these. 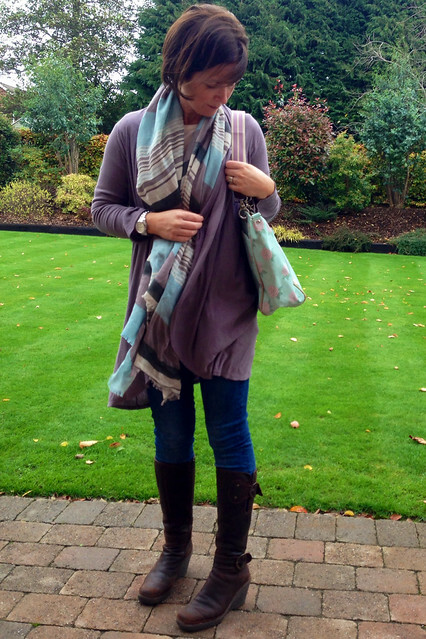 To give the bag some perspective, I styled it up with a simple mum-friendly outfit - skinny jeans, long wedge boots, a flattering draped cardigan and a scarf (all old favourites from my wardrobe). 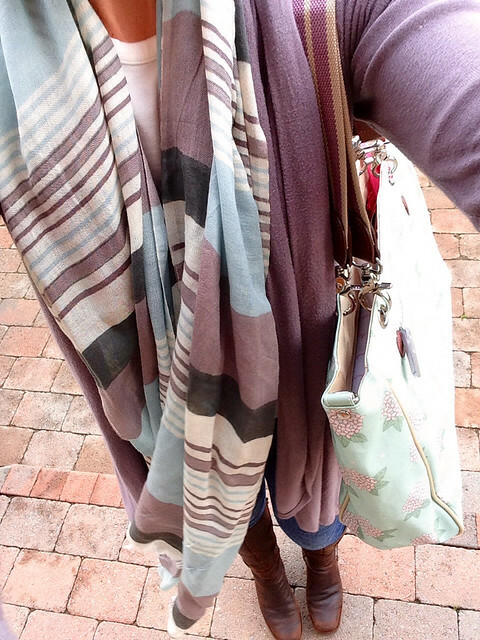 I know I say it all the time but scarves are great for pulling an outfit together but they're also useful for breast feeding - especially if you're still getting the hang of it in the early days - AND for making a sling to carry your tiny one in (loads of video tutorials on YouTube). So now for the best bit - I'm giving this gorgeous Bramley bag, worth £69.99, to one lucky reader. To be in with a chance of winning, simply follow the instructions on the rafflecopter app below. And if, like me, you're past the changing bag stage, wouldn't this make an amazing gift for someone who's expecting or just given birth? The giveaway will close next Sunday evening at midnight and I'll announce the winner on Monday. UK entries only. my changing bag essential is alcohol gel, perfect post nappy changes on the go and some lovely hand cream to bring back a bit of luxury in your life! My changing bag must have is nappy bags and a change of clothes you have no idea how many times I have had to change my little boy when out. I now carry three pairs of clothes everywhere! Oops forgot to say - my changing bag essential is several spare pairs of baby socks as my little one is always kicking them off! Besides the obvious nappies, wipes & hand gel, my changing bag essential has to be my mini make up bag which always contains hand cream & lip balm. Would love this for a friend who just had a baby . Hand sanitizer gel is a must for the nappy bag when you are out and about! After trying to get pregnant for 4 years with a 2nd child, our IVF has worked! Going to be needing a bag like this to help get us all out of the door on the school run come next year! Love their changing bags, I've often admired one my friend has. Such a beautiful changing bag! I love all the pockets, you can never have too many! And I always like somewhere you can attach your keys, a changing bag can be like a tardis at times, you can never find anything! Finally, it needs to be wipeable, I have gotten so much nappy cream and milk over mine! and Sudocrem in the changing bag! With slightly older little ones, I've always got raisins and bottles of water in my change bag! My changing bag must have is a muslin, a great multi tasker as a nursing cover, emergency bib, shoulder cover for burping, light blanket and sunshade, and I am sure this is not an exhaustive list! I would love to win this! Five months pregnant with our first bambino! I have been on the look out for a really nice one! 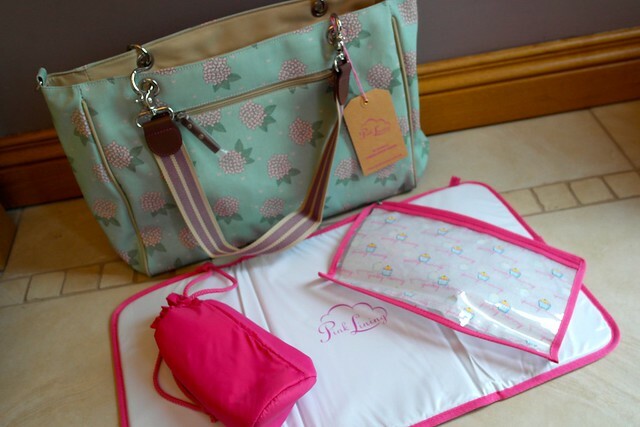 The bag looks fab, thanks for your review! Never tried Pink lining bags before but I keep hearing so many good things about them. Snacks for the girls and loose change for a coffee! my tommee tippee bottle warmer! A spare pair of clothes and bibs! A clean top for me! Walked around far too many times now smelling of sick to go without! My changing bag essential is a spare outfit and vest. Had a few exploding nappies in the early days lol! Love the blog as I havnt a clue about fashion. 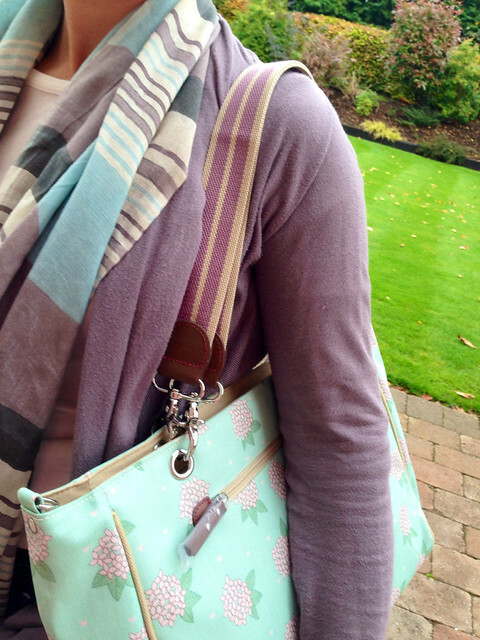 Changing bag must haves - plenty of pockets and places to keep everything and anything. Never ceases to amaze me how much *stuff* you need with a baby!